Why is Amazon PPC so Important? Mastering a PPC approach is crucial for an Amazon seller. When launching a new product, you need to get your product in front of people because it starts poorly ranked. The best way to do this is to utilize the PPC system. Therefore, reaching users when searching for a keyword of your choosing. PPC isn’t only for beginners. Managing and adapting your PPC strategy is an integral and persistent part of your Amazon business. At any given moment, there’s new avenues to explore to potentially help increase your sales. It’s a matter of finding them. Another reason why Amazon’s PPC is so important is its potency. All PPC systems act similarly (Google Ad words, Facebook, Instagram etc..). You set up a campaign, what you wish to get to people gets there, and whenever someone clicks, you are charged for it. Although they all have the same concept, which one of these platforms possess the demographic that has the intention of spending money? Amazon. For example, if you advertise a product on Facebook, you might gain interest, but how many of those people like your product enough to make a purchase? It might just be “bookmarked for later,” or like it, but move on with what they were doing simply because they aren’t in the shopping mood, or have money to spare. People visit Facebook for a variety of reasons; people visit Amazon for one reason- to buy things. The importance of Amazon’s PPC lies in the fact that sellers can experiment and test products in front of people with new interests. If you have tools to research keywords, like AMZScout keywords explorer, you can find new keywords that might go well with your product. When you have a keyword, ask yourself “What is a person looking for when they search for this? Would the person looking for that find my product interesting?” This is an opportunity to test products in different environments. The knowledge gathered from this can lead to adjustments to a listing or product. It might also give you an idea on a new product variation or an entirely new product line. Now that we have gone over importance, let’s get into some useful tips to follow. In one of our previous articles, we discuss in detail what each keyword match type is. If you aren’t familiar, we suggest reading the previous article before going past this point. The logic is simple, you start with a broad scope and narrow it down to things that work best. This is a basic strategy implemented by identifying crucial keywords and putting them into a campaign on a broad match type. Now, let it run. It’s best to select short-tailed keywords (one or 2 words) since you want to give the campaign space to generate as many new keywords as possible. A broad campaign will most likely run on a numerous long-tailed keywords that you can extract from your reports. Then select some keywords that have generated sales, and put them into a campaign with a phrase match type. Once that phrase campaign runs for awhile, pick out the most potent results and set them up with an exact match type. How campaigns are organized and how long they run is up to you. Keep separate campaigns for each match type and have them run continuously. Put keywords that are extracted into negative keywords because can take awhile for certain ones to show up.This will quicken the process. Long-tailed keywords have a lower search volume. This is why it’s good to keep your broad and phrase campaigns running. If you are a new seller, you might be wondering what a negative keyword is. They are an aspect of PPC management that often gets overlooked, especially by new sellers not understanding what they are and do. It’s quite simple, you put negative keywords in your campaign so that those keywords aren’t included in them, more on them later. Unlike manual campaigns, auto campaigns run on a wide range of keywords based on standards generated by Amazon’s A9 algorithm. Setting up an auto campaign should be set up immediately when selling regardless of what else you planned for your PPC. Auto campaigns are similar in nature to a broad match type with the exception of its limitations not being by keywords, but by general clusters of information generated by your listing. However, there are other specific differences auto has in comparison to manual campaigns. First, it gets smarter over time. The longer an auto campaign runs, the more it adjusts towards successful keywords. This is quite useful as a new seller finding your bearings. It can’t do all the work for you, but once you collect enough info, you can create successful manual campaigns. A good way to know if you mastered PPC(to a degree) is to see if you can outmaneuver your auto campaign. Another distinct feature of an auto campaign is that it shows your add on other listings-something that can’t be done with a manual campaign. We can’t know for sure, but if you show on a competitive listing, and you get the sale, you will most likely outrank that particular competitor.An auto campaign should serve as a source for new keywords to include in manual campaigns. This is why having one run constantly in prudent. Remember, always put keywords you extract as negative into the auto campaign. Take full advantage of its exploratory potential. Managing your bids is an integral part of PPC management. A main goals is budget efficiency. You want as much return as possible. Although easier said than done, getting a decent ACOS(Advertising Cost of Sale) on your campaigns is a lot of trial and error. As you adjust, it should be a priority to be economical with your bids. When you are first adding high search volume keywords or high bid (most likely exact match type) keywords it’s best to go from a low bid and gradually increasing it to a point where it synergizes with your budget well. This way you are mitigating the risk of your campaign eating up all of you budget is a small amount of time. Of course it’s no use to lose every bidding battle and not to spend any of your budgets either. The idea is to increase your bids to a point where your budget gets spent but it lasts the whole day. This strategy can also be employed by creating a campaign that contains a number of keywords that you wish to rank as high as possible for (or that have a high ACOS). Put in the highest suggested bid and turn on the bid +option. Any keywords in a bid+ campaign will spend up to 50% of the bid that’s entered in order to secure the highest bid. Outbidding strategy should be seriously considered for keywords that yield a low ACOS, but are at a low search volume. This way, you ensure getting the maximum effectiveness out of it. As mentioned above, negative keywords can strengthen your campaigns. Yet, seller’s don’t always understand how to use them. You identify negative keywords and use them in different ways for different reasons. One reason is when running auto campaigns, or broad or phrase manual campaigns. After studying your report, identify your keywords that are not performing well. Those keywords are the ones that you have spent money on, had a number of impressions, and failed to make a sale. Another reason to use a keyword as negative is if it has a very high ACOS. An acceptable percentage of ACOS should be related to your profit margin. Using the example given above, ($30 selling price with a $12 profit per unit), your limit for an acceptable ACOS for a keyword should be at 40%. This means you should remove (make it negative) a keyword if it has a constant ACOS of 40% or above. The final reason for why you should be using negative keywords is so that you don’t bid against yourself. If you extract a keyword from a broad and put it into a phrase or exact match type you should make sure that the same keyword is a negative keyword in a campaign that contains the original broad match type keyword. This is because the new phrase (or exact) keyword will be bidding against the original broad match type keyword since it’s contained in it. You would be bidding against yourself and spending more money than you should per click, be extra careful to avoid that. Much of what has been discussed in this article implies regular, diligent extracting and studying of advertising reports. If you aren’t doing this, it’s almost certain you are not selling as much as you can be using PPC. Advertising reports only gather 45 days of data, so it’s important to save them to have historical insight into your PPC. 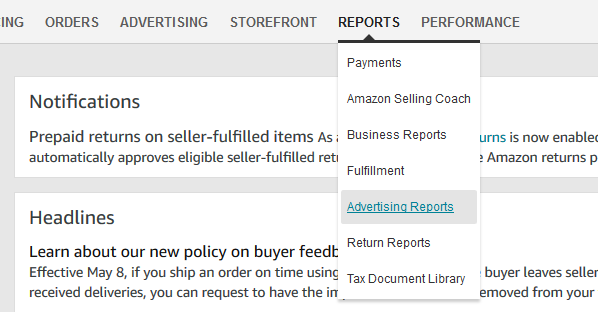 They can be downloaded as an excel file through seller central by clicking on “REPORTS” and selecting “Advertising reports” from the drop down selection. This brings you to a page where you can put a range for the period of the last 45 days. Then, generate a report and download it. The Excel file generated gives you a detailed data rich insight into the performance of your PPC campaigns. Here, you can see where each click came from, what the customer searched for, and where the keyword came from (a broad/phrase match type or an auto campaign). The reports provide over 25 metrics. Seller Central gives you 12. The more info you have, the better decisions that can be made. If you follow any AMZScout content or use any AMZScout tools, you know we subscribe closely to this line of thinking. These reports are also one of the best avenues of discovering new ways of improving sales. It’s where you find pleasant surprises to find links to keywords you never thought would source a sale. Insights from reports should be the foundation for your PPC strategy. It’s a vital part of using PPC properly; it’s a vital part of being an Amazon seller. In conclusion, managing PPC is one of these more important duties an Amazon seller has. Mastering, and improving it is a constant learning experience. However, the key aspect of PPC is that your works never done because everything is constantly changing. Keywords that worked once, might not work so well anymore. Bids for a certain keyword, can skyrocket. Search volumes change constantly. Be willing to revisit some old ideas, and recognize when new ideas don’t work anymore. Although difficult, they are necessary in order to be successful and maximize potential growth.Good luck sellers!